Photo measuring slightly more than 4.25 x 3 inches, mounted on a cardboard frame/backing (measuring slightly more than 7 x 5 inches; most of the backing has been cropped from this scan). I promised I’d post another photo of our guy from Vandergrift, the guy on the left. I previously posted a photo of him here. I have three photos of him (the third is him solo), and I’m virtually certain they are the same guy. I can’t help but question it, though, because the slight variations in his hair, the lighting, and his facial expression (not to mention the company he keeps) can completely alter the impression he gives off. I find that fascinating, which is part of why I wanted to post more than one. By the way, the damage to the frame that I cropped from the scan includes letters of the alphabet drawn by a child who was apparently practicing penmanship! Brothers, do you think? I see almost no clue to that except age. 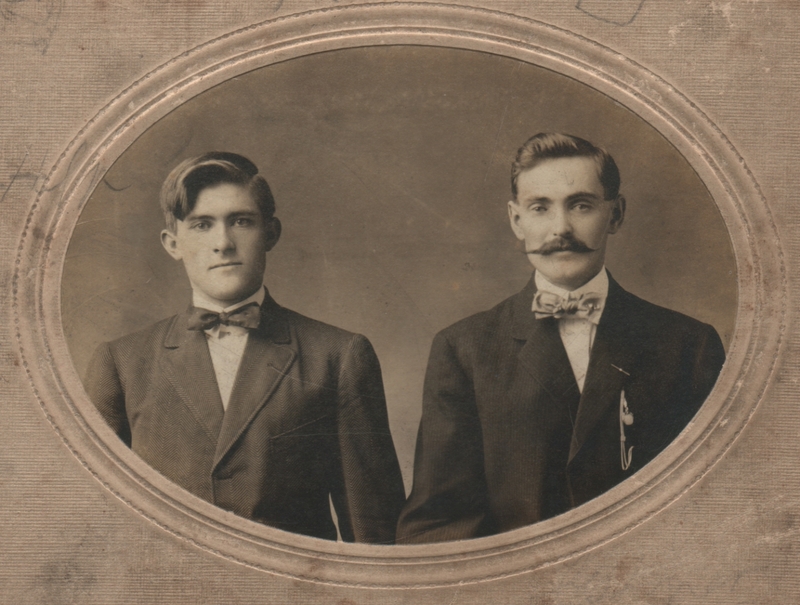 But something about the pose and bowties says brothers to me. Possibly. Hard to say. They don’t really look alike to me, but then again I’ve know fraternal twins who don’t even look related. Maybe cousins, bearing in mind that this photos is from a time when extended families played greater roles in each other’s lives? Maybe just friends? Yes to all of those possibilities. I don’t know about the cost of photography in their day, but I also don’t know enough about their clues to discern whether they have “family photography only” or “lots of photography” money. So. Let me know when you find out. I don’t know, he still looks like he’s got a chip on his shoulders. Maybe in this one, he is a bit more able to conceal it. But I still see the edginess in his disposition. Ha, that’s funny that you’re still having that reaction to him. Perfectly valid, of course, but it makes me wonder, as the person presenting these, what people’s reactions to him would have been if I had reversed the order and shown this one first.